I’m coming off a post-show high. You know that feeling: the excitement, joy and pride, paired with the knowledge the run is over. Soon a sadness comes, when the cast goes their separate ways, that fabulous group of people will never be performing together again. After all theater is just “A Moment in Time”. 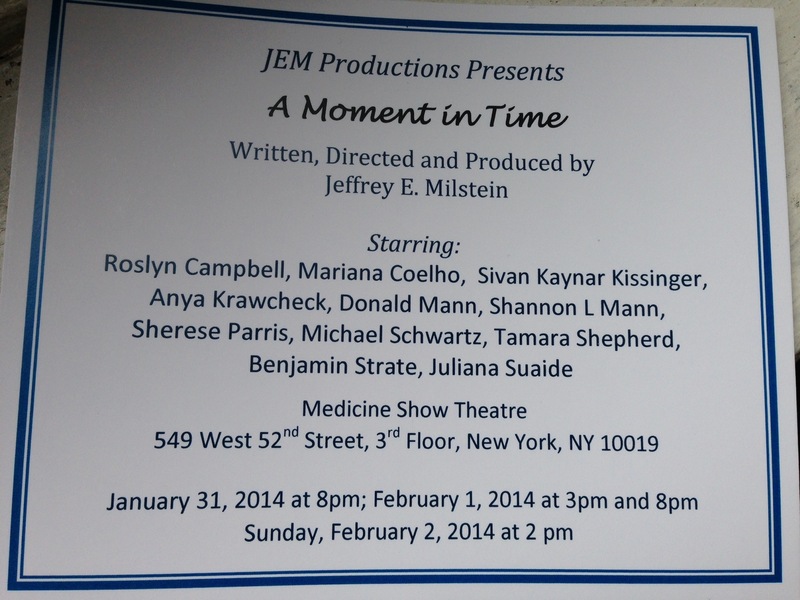 …Funny, the show was named “A Moment in Time”. It was produced at the Medicine Show Theater, on 52nd between 10 and 11 ave. I played Andie, a teen, dealing with the mortality of her Grandmother. I’m happy whenever theater is made, and I’m happy to be a part of the process. It took a lot of bravery for the author to tell this story. And I’m so proud my cast brought the intensity they did!